MLT specializes in a number of laser processes for rigid and flex materials including laser microvia drilling, laser cavity formation, and precision routing and excising. We have extensive experience with most of the rigid and flex materials used in today’s electronics production environment. Our laser processes are for both copper clad and unclad laminate manufacturers with a varying assortment of dielectrics, reinforcements, and chemistries. A prepreg is a system of fiberglass impregnated with resin. The resin and compatible glass styles are determined by what properties are required for a specific circuit board design. Prepregs and laminated cores are also available in High-Tg and halogen-free types. • Rolled Annealed (RA) copper = Smooth surface ideal for FPC. Stiffeners: – Epoxy-glass (FR-4), polyimide-glass, polyimide, copper, and other mechanical support material. Please contact our sales staff if you have a specific material you want to laser or any questions about capability. 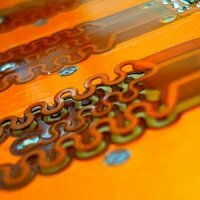 Below are quick links to product selector and material guides for common PCB materials.